On October 8th 2017, the leftist propaganda website The Wire had published a shoddy hit job against Jay Shah, who is BJP party president Amit Shah’s son. In no time, their article, which was riddled with glaring loopholes, was decimated by us. Subsequently, The Wire had selectively altered its story, but the shaky ground on which the story stood remained thus. After this hit job by The Wire, Jay Shah had slapped a 100 crore defamation suit on the website and the author of the article, Rohini Singh. What followed was the usual liberal rhetoric. Opeds were written about how freedom of expression is in danger and Press freedom is being thwarted. Soon, Jay Shah approached the civil court at Ahmedabad which granted him an ex parte ad-interim order against ‘The Wire’ and its founding editors, including the author of the article, Rohini Singh, stating that they be barred from publishing anything, directly or indirectly in connection with Jay Shah. “The Wire” then approached the High Court of Gujarat at Ahmedabad, appealing against this particular gag order. 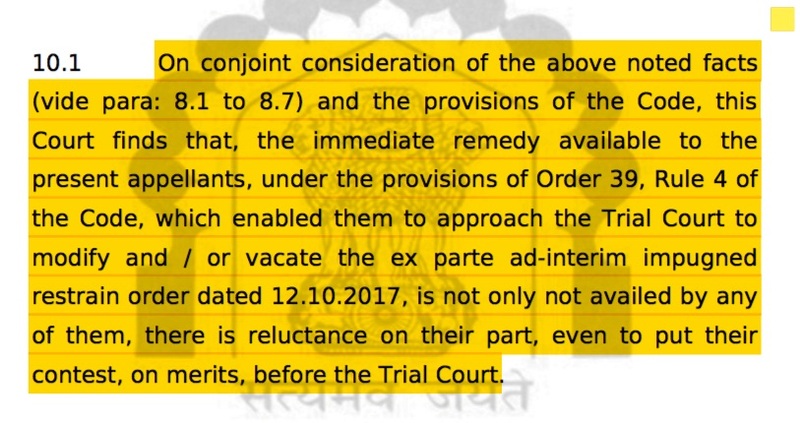 The High Court made some interesting observations and rejected the plea of ‘The Wire’ against the ex parte ad-interim order. 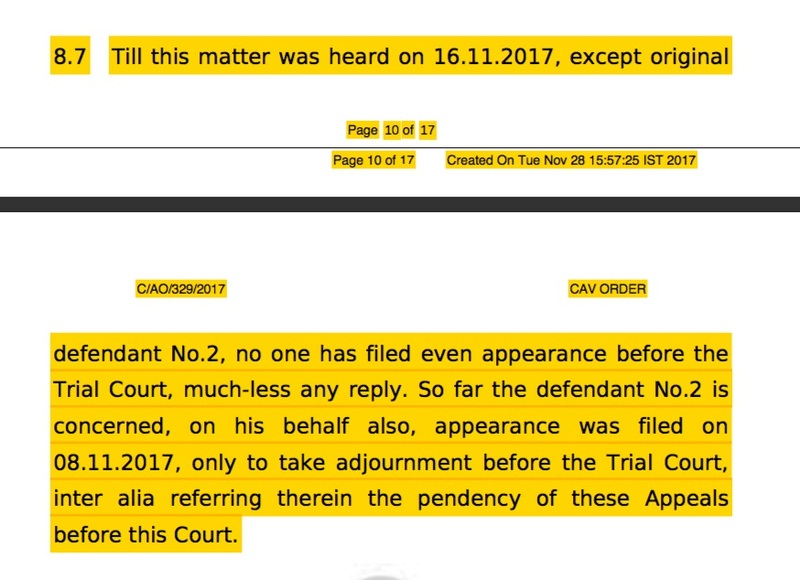 In paragraph 5.2 of the counsel of Jay Shah submitted, that the defendants (folks from The Wire), “are reluctant to even appear before the Trial Court”. The counsel also submitted, that except for Defendant No. 2 (which appears to be Mr. Siddharth Varadarajan judging from the tweet attached herewith) who filed an adjournment application in the Trial court, the other defendants have not even filed their appearance before the Trial Court, though they were aware of the proceedings and had even received the full set of papers within 4 days from the date of initiation of the proceedings by the Plaintiff (Jay Shah) and passing of the impugned order by the Trial Court. The submissions of the Counsel of Jay Shah, was later also confirmed by the High Court in its judgement. The lack of motivation on that part of Team Wire was mentioned in Para 10.4 which has been discussed further in the article. Another interesting observation is made in Paragraph 8.7 of the High Court judgement. 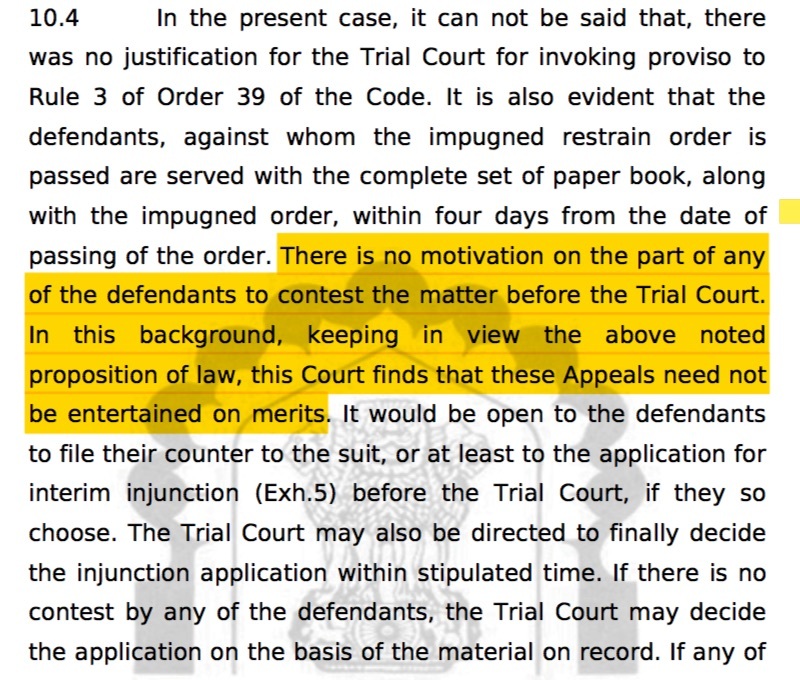 The court has made it amply clear in its judgement that till the ex parte ad-interim matter (gag order matter) was heard, none of the defendants (folks from The Wire) had filed even an appearance before the Trial Court, much less any reply. Defendant No. 2 (Siddharth Varadarajan) had filed appearance on 8th November 2017, only to take adjournment before the Trial Court. Siddharth, on 13th November 2017 had tweeted that his team was outside the Ahmedabad court waiting for Jay Shah who did not show up. The court has observed that Defendant No. 2 filed an adjournment application on 8th in the Trial Court, citing the reason that the matter is pending in the High court, and that none of the other defendants had even filed an appearance or reply till 16th, when the matter was heard. The next pertinent observation is made in Paragraph 10.1. The court observed that under the provision of Order 39, Rule 4 of the Code, The Wire could have approached the Trial Court itself to modify and/or vacate the ex parte ad-interim impugned restrain order dated 12.10.2017 (Gag order), but ‘The Wire’ did not avail of this option. The court then makes a rather scathing indictment of team Wire saying that “there is reluctance on their part, even to put their contest, on merits, before the Trial Court”. If the court has observed that team Wire was RELUCTANT to contest their case on merits before the Trial Court, one wonders why they went around town asking for donations in the name of ‘fighting for freedom of the press’? The High Court didn’t indict The Wire of lack of motivation just once. It makes a similar observation in Paragraph 10.4. 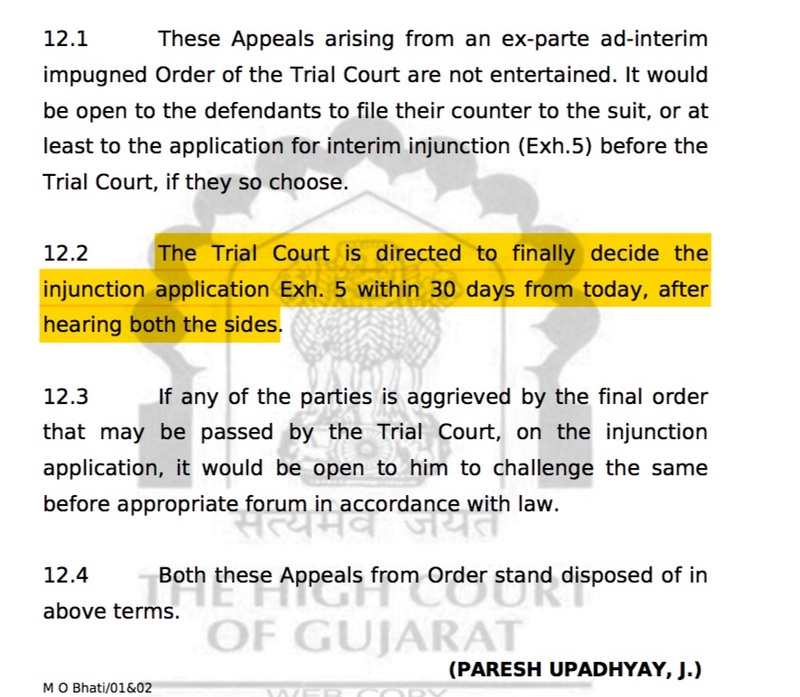 The High Court of Gujarat at Ahmedabad observed that since “there is no motivation on the part of any of the defendants to contest the matter before the Trial Court, keeping in view the above noted proposition of the law, this court finds that these Appeals need not be entertained on merits”. This would, in laymen terms mean that the court refused to entertain The Wire’s appeal of vacating the gag order on the ground that The Wire was least motivated to explore their options of approaching the Trial Court and argue the case on merits. 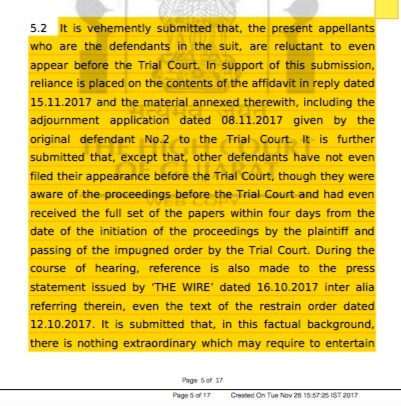 The High Court has observed that team Wire can, if they so choose, approach the Trial Court to decide the injunction application within 30 days from today. In the light of this judgement from High Court of Gujarat, one is forced to wonder why team Wire was grandstanding after the restraint order, when they were reluctant in “arguing the case on merits” according to the High Court. Why did they approach the High Court when, as per the High Court, they could have simply approached the Trial Court appealing to modify or vacate the gag order. Most importantly, one wonders, that since The Wire has asked for donations in the name of fighting this case, are its readers aware of all the developments and the seemingly lackadaisical manner in which The Wire has chosen to defend itself in the court of law. The case is sub judice, hence, it would be incorrect to pass a judgement one way or another, and it is certainly not my place or intention to do so. But after today’s order, it certainly seems like the future holds interesting surprises.